I do a lot of reading, which usually results in me seeing a lot of scary money statistics. Between research for posts here on Frugal Rules as well as my freelance writing clients, there’s ample opportunity for doom and gloom. Some of these statistics on money really aren’t that surprising as we’ve all heard them, but others are downright head scratchers. It’s easy to look at some of the reported numbers and believe all is lost. That’s not the case, in my opinion. Looking at numbers in a vacuum can be a bit misleading, or make you think they can’t be turned around. To address the latter point, I’ve included an action point for those wanting to improve. After all, it was someone that took the time to give me action points and a little tough love that helped me overcome my problems with debt. 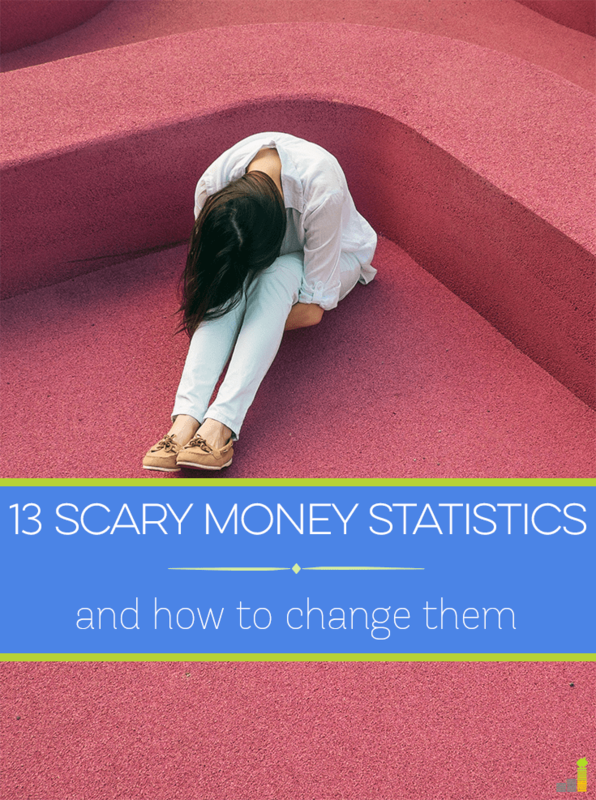 With all that being said, I thought I’d share 13 scary money stats (Halloween is this week after all 🙂 ) and an action point or relevant Frugal Rules post to help attack the issue. They’re not meant to oversimplify the action needed for change, but rather are simply a means to get started in the right direction. 1. We have $165 billion in food waste. I knew there was a lot of food waste here in the States, but John Oliver’s episode a couple of months ago dealing with food waste revealed the magnitude of the problem. We waste $165 billion in food each year or roughly $520 per person each year. Put another way, it’s enough to fill 730 pro football stadiums. Ironically enough, 1 in 6 people in America deal with hunger daily. It’s mind boggling that we’re dealing with each issue, though they point back to the same problem. Food waste is the much easier problem to solve. It comes down to appropriate meal planning and viewing the food you’re throwing away as money you’re putting in the trashcan. How Guilty are You of Food Waste? 2. Waiting to save for retirement until age 45 means you have to put away three times as much as someone who starts saving at age 25. This scary financial statistic is thanks to the folks at the Center for Retirement Research. The underlying problem is not understanding compound interest. I know it may feel like you can’t start saving for retirement when you’re young and have little money, but it can be done. Think of it this way, the longer you put it off the more you’re harming yourself. Find a broker, like Wealthsimple that allows you to start investing with no minimum balance requirement, and start. If you have access to a 401(k) match then take it – it’s free money. It might feel like that extra $50 per month won’t do anything for you but trust me, it will. 3. We spent over $70 billion on the lottery in 2014. I know playing the lottery can be fun. We’ve played it a few times ourselves, when the jackpot is like $500 million. But when you see that $70 billion spent equates to $300 per year per adult you start to wonder how else that money could be used to grow wealth. There’s nothing wrong with dreaming about leaving your job but there are many other ways that money could be better spent, in my opinion. 4. 51 Percent of Americans are putting off major financial decisions. This isn’t necessarily a scary money stat, as it could be for legitimate reasons. However, the American Institute of CPAs (AICPA) found that over half the people they polled are putting off major decisions due to finances. Those decisions range from buying a home to starting a family to saving for retirement as well as having multiple goals to tackle at the same time. The study shows some of the problem goes back to consumer debt and lack of savings. I believe the underlying issue here is, of course, making wise financial decisions but also goal setting that’s in tune with your priorities. 5. 25 Percent of Americans making at least $100,000 per year are living paycheck to paycheck. This money statistic was reported by CNBC earlier this year, which also reports 33 percent of those making $75,000 or more are in the same predicament. I’m not going to pretend to know the reason behind these statistics though it goes to show you that just because you make a good salary doesn’t mean you’re good with money, as the study shows many respondents admitting to poor financial decision making. This, in my opinion, requires having a long-term view of money and putting off things in the present to save for the future. 6. $40 of your monthly gym membership is wasted. Statistic Brain reports Americans who have gym memberships waste $39 of it per month due to lack of use. Over the course of a year that equates to $468 of waste. That may seem like nothing, but that lack of use directly impacts the amount of money you have working for you each year through misuse – which can add up to real money. Working out at a gym is a great way to lose weight…if you’re going. I lost 100 pounds by not stepping one foot in a gym, rather finding other ways to work out. It can be done with a little creativity. 7. 2.5 million Americans took out car title loans in 2014. I know this may not seem like a terrible number in relation to the number of cars on the road, but as Yahoo Finance reports, these kind of loans are worse than payday loans. There are a number of reasons for this, largely coming down to the ease of securing said loan. If you don’t make the payment in time you risk either losing your car or getting more money added to the loan – which can be more than you can get under a typical payday loan. I’m not certain as to the solution, other than to avoid being in this situation. Finding ways to make extra money or getting an unsecured personal loan to consolidate all outstanding debt is a start as it would allow you to pay less in interest and fees. 8. 21 Percent of Americans aged 75+ are carrying mortgage debt into retirement. Mortgage debt is generally considered “good” debt, but I’d venture a guess that mortgage debt isn’t really a good thing when you’re over 75. USA Today reports the number for those aged 55-64 is 30 percent and those people are carrying an average balance of just over $100,000. At a time where individuals should either be preparing for, or in retirement this is a scary financial statistic. Again, there may not be a true solution to this, aside from better preparation, but it is concerning given needs that could arise with caring for aging parents. Can You Ride your Motorcycle into Retirement? 9. A .75 percent difference in investment fees can mean losing $30,000 over 20 years. This scary money statistic comes to us from the SEC. In a hypothetical portfolio of $100,000 if you choose an investment charging 1 percent in fees and stay with it for 20 years you’ll be out $30,000 vs. a fee of .25 percent. This may not seem like much, but consider the impact of having an even higher fee product or investing more than $100,000. That can lead to a significant chunk of money that could be better served in your wallet – not someone else’s. This is where a tool like Personal Capital can help you as it helps you find lower fee alternatives. 12. The average car payment is now over $480. Car payments are often attacked in the personal finance community. We’ve had them in the past, though we plan to never have one again. I really think it comes down to personal preference is some situations, but in many others it’s concerning to see so much spent each month on a depreciating asset. A car is a necessity for most, there’s no denying that, but it can be done without the shackles of a massive car payment. What Could You Do with an Extra $470 Per Month? 13. 52 percent of Americans would not be able to cover an emergency of $400. The Federal Reserve reports a majority of people polled would need to sell something or borrow funds to cover an emergency amounting to $400. This is honestly one of the scarier money statistics in the post as a $400 emergency isn’t all that much to speak of – it could be a relatively minor car repair or your air conditioner going on the fritz. Experts debate how much you need in an emergency fund, though I tend to say 3-6 months of living expenses is a good range to aim for. I know that’s a lot of money for many. Don’t let that hold you back! Start saving $50 per month until you hit $500 and grow it from there. Having incremental goals will build momentum and get you where you need to be much quicker than simple avoidance. Statistics aside, I know it can be a challenge to feel like you can make any headway when things look bleak. Don’t give into that feeling. Rather, take one thing and find a way to tackle it, one day at a time, and then take on another. Put one foot in front of another and you’ll be amazed at how far you can get. 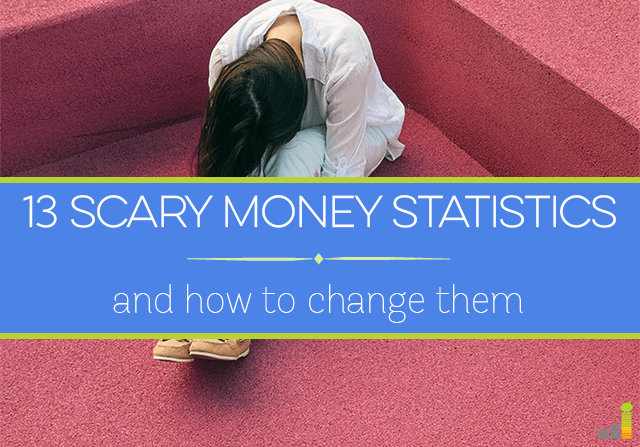 What scary money statistic stood out to you the most? What’s one bright area you see? What’s one area you’d like to start focusing on in the near future? The lottery statistics always jump out to me as unbelievable that so much is spent. When I was in college I worked at a convenience store. I could not believe the amount of people who came in each day to buy tickets, with everything from dollars to pennies. I know! I had the same experience when I was in high school and worked at a convenience store that sold lottery tickets – it just boggled my mind. Wow this is terrifying! The lottery gets me. Drives me nuts!! That they are Mindy. I think it’s low as well. I know that we know people, far too many unfortunately, that are in this position. That being said, there was a point in time where I was as well – it makes me *somewhat* hopeful…if I don’t listen to my cynical inner self. I was immediately drawn to the health care statistic, as I work in the health care industry. There is some efforts (and actually this is the area I work in) or managing populations while providing both lower costs and better outcomes for patients. It’s a huge task and while there is some room for improvement, some of it is at the mercy of supply and demand. I imagine most people have heard of Sovaldi, the Hepatitus 3 drug that costs about $1k per pill (1 pill per day for 12 weeks) that has extremely positive outcomes compared to alternatives. These sort of breakthroughs are great for outcomes but companies want the ROI on the billions spent on R&D, so to some extent we will continue to see higher costs as long as outcomes continue to increase. I didn’t expect you to focus on any others DC. 😉 That is a good point, though there are also times where we see fools (I can’t remember his name at the moment) that got the HIV drug recently and massively jacked up the price. I’m definitely for drug companies to make money, though I’m concerned too many don’t see the need for some sort of balance. I’ve heard this one before. And it always makes me shudder. Lifestyle inflation is a scary thing. I see it happening around me as many of my friends are starting to earn better wages. It does that for me as well Kate, in addition to making me shake my head. Lifestyle inflation is very real, which is why it’s so important to guard against while also maintaining some sort of balance. There is a homeless guy who used to sit in front of the gas station in our town hoping people would give him money. I saw someone give him $8 once and he went in and spent it all on lottery tickets. I hope he got a winner. I’ve seen the same thing myself Kim. It makes me either want to scream or tell the person to go use it for food. The $400 stat is incredibly bad. We’ve had around 6-7 unexpected expenses this year ranging from $40-$1800. I would like to think we’re unlucky, but by the sounds of it, we’re very fortunate to be able to handle these expenses without going into debt. That it is Hannah. We’re in the same boat and thankful we’re in the spot where we can generally handle things. The other option is not a good place to be in. These are truly shocking statistics! What a helpful post to list them along with lots of practical tips. The stat that hits home the most for me is the food waste. Though “waste not, want not” is my kitchen mantra, my kids don’t always see eye to eye on that. Thanks Kalie! Food waste can be a biggie. We do relatively well, though it happens. I know – when we saw the John Oliver episode a few months ago it made both Nicole and I just want to do something…especially when you see so many go without. The food waste stat definitely gets me, but then I find myself throwing away rotten veggies when I clear out my fridge every other week – I’M the culprit!!! We all do it Stefanie. We usually take the view of it’s literally taking a $5 bill and putting it in the trash. Stats like this make me want to view it as food someone else could have and challenge us to change our habits. Wow, this definitely makes one to think. Thanks for putting it together. I think the food waste issue is really concerning. I grew up in Soviet Union and there were days we didn’t have enough food. It is definitely difficult to see all those people who throw it away while there are so many people in need. Not a problem at all Reelika. Thank you for sharing your experience. I agree – it is sad, especially when you see the other hand in that so many are without. It should challenge us to live differently…in many ways. Wow! What an awesome post John!! Some of these statistics are frightening but true. I have a good friend who probably spends at least $20 a week on lottery tickets. It’s crazy to me that he does it but it’s almost like an addiction that he can’t break. Thanks Shannon! Oh, I believe it on the spending per week on lottery tickets. As I responded to someone else above, I saw it working at a convenience store in high school. The amount people would spend regularly just shocked me and could tell some were genuinely addicted. Wow, John – these really are frightening statistics. I’ve long been convinced that America is on the edge of an economic meltdown – these stats confirm my fears. There’s definitely some bad numbers out there Laurie! Hopefully we learn our lesson at some point. Car title loans…I didn’t even know that was a thing. It being worse than a pay day loan is very scary. These are some scary facts and reason why we need better financial education in this country. Yep, they’re very much a thing. We see store fronts advertising them here in Omaha. It just makes me mad seeing them. The two that stuck out the most to me were #7 & #12. I’ve stayed away from car title loans, but I have friends who made the mistake of taking on out. Number 12 is the reason I will drive my car until I have enough money saved to purchase something used. Ouch, sorry to hear that Jason. We’re the same way – cash only. They all make me sad. #13 is scary because $400 is not an absurdly high number and it is scary that so many people couldn’t handle a $400 emergency. #11 doesn’t surprise me because I see that with my clients, although some even have a hard time opening up to me initially. Most don’t want to talk to their kids about money, especially if there are financial concerns. I know, right? $400 is nothing when it comes to what could happen in an emergency situation. I bet you see that all too often Shannon – I understand the desire to keep certain things private but if there are concerns they should be expressed to family members so they know how to help or what to do in the event of a passing. These are definitely some scary statistics! Food waste is one that always gets me. Now that we are in the RV, we hardly ever have food waste. However, we used to have a TON! It’s such a waste of money and it’s sad as well. I bet being in a RV helps cut down on food waste a ton! Well great. Now I have to sleep with the lights on! Seriously though, those numbers are kind of terrifying. We have, by and large, solved the food waste issue in our house. It’s not at all frugal, really, because we stopped cooking. It wasn’t working for us on several levels — the most obvious one being physical. But it also meant food was going to waste. So were fruits and vegetables we’d get at the store. So I keep convenience food around that gets used up regularly and don’t go bad as quickly. When we do get fruits or veggies, we get a very, very small amount. Yeah, that might mean going back to the grocery store — which is dangerous in and of itself — but it means the stuff doesn’t go bad in the fridge. Scary statistics for sure! Some I’d seen before, some I haven’t. When my wife started talking with her mother about her finances (whew, we got past #11), we found out she was spending a small chunk of money each month on the lottery. We convinced her instead to start entering free sweepstakes on the internet, and there’s even a site that gives you free entries based on making positive financial moves. Some consider it a waste of time, but it satisfies the same needs without spending money. As for the gym membership, that one shocked me because my wife and I together spend less than $30/month on our gym, so I’m wondering how much other people are really spending. We may not get as much use as we’d like due to injuries and medical issues, but it’s definitely a help to us, though granted not the right decision for everyone. Car title loans also made my list of scary things people do with their money, but I didn’t realize how pervasive it is. Hopefully people will start to learn that there are better ways, and your action steps are a great way to help make that happen. I see many seniors, who are on fixed incomes, buy lottery tickets, usually scratch-offs, and immediately look to see if they “won” anything. If there is a payout, they cash it and buy more. Of course, most of the cards don’t pay off, and I wonder if those people go home to empty fridges because their money was all left at the lotto counter. The lotto people keep ratcheting up the cost of the tickets, too, and concocting packages of multiple tickets, all to get more cash more quickly. We were making $100,000+ and found ourselves in the red every month. We were paying out most of my paycheck in daycare. When we found out we were expecting our third (a bit of a surprise is an understatement), we crunched numbers and found it to be more financially beneficial for me to stay home. We moved to a smaller home in a different state with much more affordable cost of living. We make half as much with three small children and are living the same way we were on the larger salary. Strangely enough, I feel we are doing better now at actually living within our means. We are attempting to pay down student loans. We own our cars. Our kick in the pants is our medical debt- we have a child with food allergies (no pb&j or grilled cheese allowed in this house- every 3 days milk in our home costs $18). The amount we’ve spent on allergy testing, hospital bills, and food costs are staggering. I’m not using this as an excuse. We are punching it out, and we will get there. When you look at budget spreadsheet and the facts are right there-you’re paying out $2500 here for a hospital stay, $700 there for testing or treatment, and we struggle to keep our food budget at $550 per month. The kids are getting bigger and they’re hungry! Its all a puzzle. This list…I can’t…It is too depressing particularly 6, 7, and number 12. So 52% can’t afford $400 for emergencies? That’s terrifying! That it is Lily, it’s crazy…and sad! A lot of whats driving America’s poor financial status is lack of education at the high school level. Not all states have the same requirements, some require testing, some don’t.